Strong, carbon steel blade with good resistance to rust. Of all the tools in your gardening kit, the trowel is one of the most versatile and often used, from planting bulbs to drilling seeds, its one of the tools that every gardener should have. 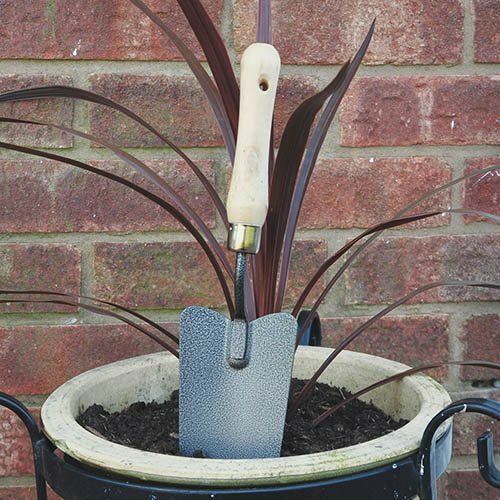 Perfect for any gardener, our carbon steel trowel makes light work of all your everyday garden jobs. Ideal for vegetable beds, raised planters and small flower beds, use it for all of those small digging jobs where a spade would be too large. With a traditional wooden handle, ergonomically shaped for a comfortable grip, it's also an attractive addition to your gardening kit. It's also drilled at the end for you to add your own chord if you wish to hang it up. Made from durable carbon steel to repel rust, its a robust tool with good resistance to wear, so it'll cope well with regular use. Overall length 32.5cm (12.8in) long x 8cm (3.75in) wide.